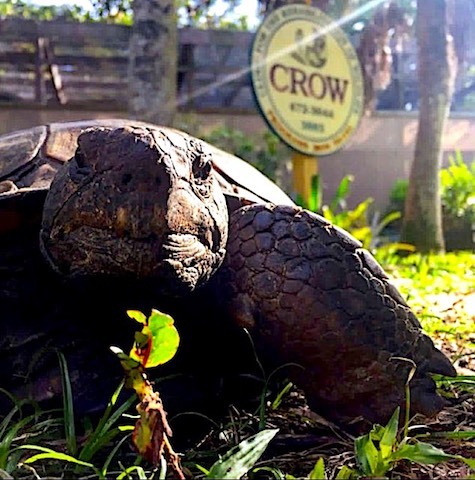 A gopher tortoise and Animal Ambassador at the Clinic for the Rehabilitation of Wildlife (CROW) for the past three years, has been returned to the wild at Perico Preserve in Manatee County after being deemed rehabilitated and capable of survival by state officials. 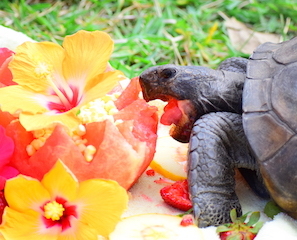 Shelldon, an adult male gopher tortoise, first arrived at CROW’s wildlife hospital on July 4, 2015 after being struck by a vehicle and dragged along the pavement for a short distance. As a result of the incident, Shelldon suffered carapace (upper shell) fractures, loss of a majority of his front claws and 70% of his plastron (under shell) was degloved, or scraped away. 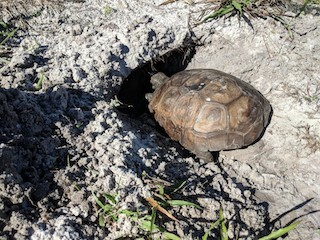 With time, veterinarians at the wildlife hospital were able to repair his shell fractures, but Shelldon’s front claws, which are vital to gopher tortoises ability to dig a burrow, never grew back and his plastron left him vulnerable to injury. Since his old burrows had likely been destroyed during his time in the hospital and he was unable to dig a new one, Shelldon was determined to be non-releasable and became an Animal Ambassador at CROW. As an Animal Ambassador, Shelldon became a favorite for all ages who visited CROW’s Education Center or met him at outreach events around the county. He helped teach thousands of people about his species and the important role they play in the environment as a keystone species. 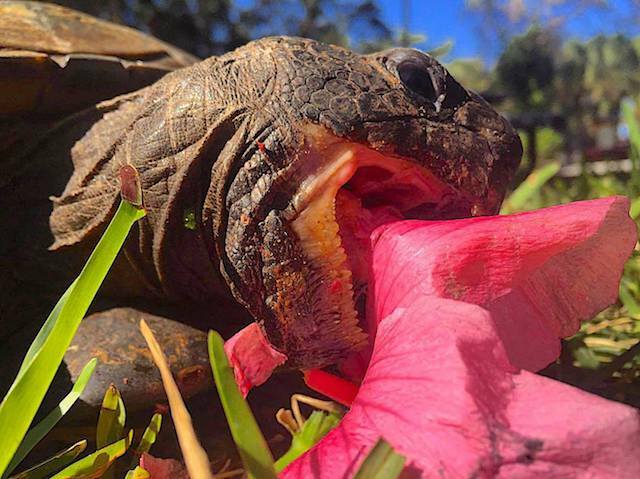 When not on the job, he spent time in his man-made burrow or grazing on hibiscus flowers brought for him by CROW volunteers. It was only in recent weeks that Shelldon began exhibiting behavior the staff had never seen from him before. He began to dig! At first, it was mere scrapings in the dirt, but Shelldon was determined to dig his own burrow. Gradually, his scrapes turned to divots and the divots turned into holes. 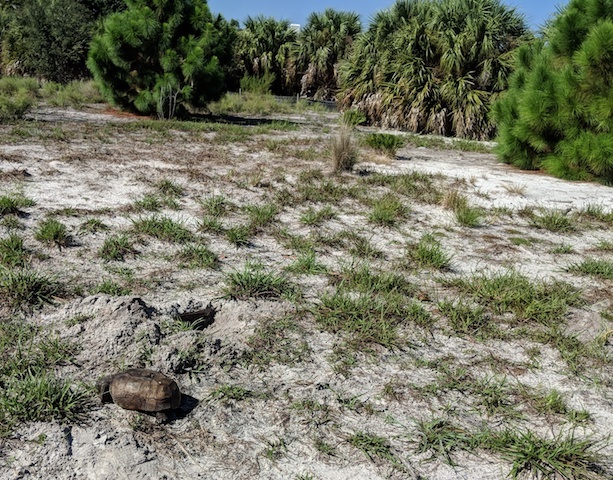 State officials were contacted to consent to his release and working with Florida Fish and Wildlife biologists, it was arranged for Shelldon to be released on Monday, August 27 to a starter burrow at Perico Preserve in Manatee County. This 175-acre park has undergone extensive restoration efforts since 2012, transforming abandoned coastal farmland into a landscape with native habitats. 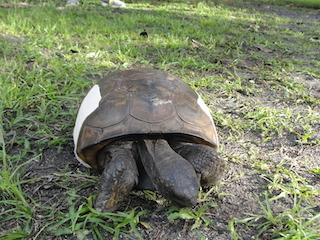 While Perico Preserve offers the ideal habitat for a gopher tortoise to thrive, it also offers an added benefit for Shelldon. His new burrow will be monitored by staff at the preserve to ensure he is adapting well to his new home. 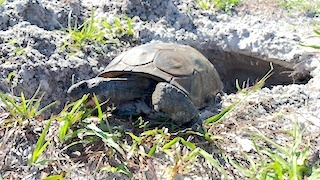 Learn More about Shelldon's new home, Perico Preserve, at MyManatee.org!